BACKGROUND: The minimum dose of food protein to which subjects with food allergy have reacted in double-blind, placebo-controlled food challenges is between 50 and 100 mg. However, subjects with peanut allergy often report severe reactions after minimal contact with peanuts, even through intact skin. OBJECTIVE: We sought to determine whether adults previously proven by challenge to be allergic to peanut react to very low doses of peanut protein. METHODS: We used a randomized, double-blind, placebo-controlled food challenge of 14 subjects allergic to peanuts with doses of peanut ranging from 10 microg to 50 mg, administered in the form of a commercially available peanut flour. 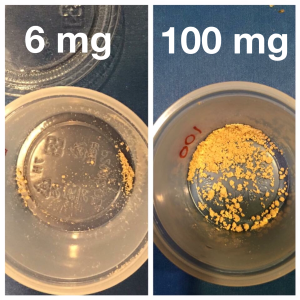 RESULTS: One subject had a systemic reaction to 5 mg of peanut protein, and two subjects had mild objective reactions to 2 mg and 50 mg of peanut protein, respectively. Five subjects had mild subjective reactions (1 to 5 mg and 4 to 50 mg). All subjects with convincing objective reactions had short-lived subjective reactions to preceding doses, as low as 100 microg in two cases. 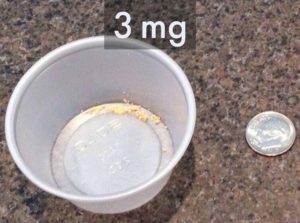 Five subjects did not react to any dose up to 50 mg. CONCLUSION: Even in a group of well-characterized, highly sensitive subjects with peanut allergy, the threshold dose of peanut protein varies. As little as 100 microg of peanut protein provokes symptoms in some subjects with peanut allergy.